A PLAN to create the UK’s biggest eco village on the site of a disused wool factory have been unveiled. The former Paton and Baldwins factory, on the outskirts of Darlington, will be transformed into a flagship ecological community. The vision would result in the 110-acre Lingfield Point business park, as the site is known, being transformed with more low energy offices, eco homes and leisure facilities powered by renewable energy. There would also be sustainable transport links, such as bus services, all designed to protect the environment. Central to the vision is the new Darlington Eastern Transport Corridor, now under construction, which will link the A66 to central Darlington. We are pleased to announce that the new Journey Planner is now online! We hope you find this new facility extermely useful in helping you continue making sustainable travel choices. Apparently, the only sustainable transport choices are walking and buses. I’m about to leave to meet with another campaign member at his house and the planner suggested various bus/walk combinations, but not once suggested I ride my bike there. There is a button to toggle bike routes on/off while using the map, and the blue lines are fairly helpful, but they suggest that there is no bike route by my house or my destination, yet looking outside I see the road is still. Please, planner-creators, how about a link from the results page to a map of cyle routes and secure parking places, with the start and end points of the journeys indicated? Here’s my suggestion of what the planner could look like. 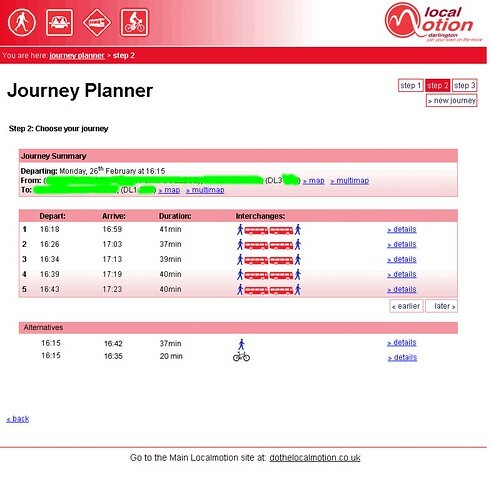 As you can see, the fastest option for this journey which I make every week day is by bike. Even walking the whole way is faster than the times given for the walk/bus/walk options, and walkers don’t get stuck in unplanned traffic. We have worked with consultants engaged by Cycling England on the development of an online cycle planner – but are not yet in a position to launch this facility. So, there is going to be a cycle planner, but it will be separate from the Journey Planner. 4×4 too big to fit in one car park space? Rather than buying two tickets, why not get the bus? Worried about getting stuck in queues of traffic when the Eastern Transport Corridor work causes disruption on Haughton Road? Ride your bike or walk. In the run up to our Symposium on Saturday 17th March, we’ll be updating a second website, Darlington Cycling Symposium 2007, with details of the agend and aims. An slightly edited version of the letter Richard sent to the Northern Echo was printed in today’s paper. You can read Richard’s original letter: Cyclists and Disabled Unite and the leter as printed in the Northern Echo.